Celebrate St. Stephen’s Day with us on the 20th of August in Budapest! August 20th is the greatest national holiday for Hungarians, celebrated with spectacular fireworks. August 20th commemorates the foundation of the Hungarian state. It is also called as St. Stephen’s Day, remembering Stephen I, the first king of Hungary and founder of the Kingdom of Hungary. What do Hungarians celebrate on the 20th of August? 20th of August – or called St. Stephen’s Day as well – is one of the biggest national holidays of Hungary. King St. Stephen, who was canonized August 20, 1083, by Pope Gregory VII, was the first monarch of Hungary. This day became an annual celebration in 1771 by Maria Theresa, who specified it as a national state and church holiday as well. Since then Hungarian people celebrate on the 20th of August with all day long festivities, creative programs, and firework. What do we offer to you during your Budapest Danube Cruise? Live Entertainment on the stage, there are two opportunities for our customers, one of them is Folklore Show, the other one is Live Piano Show. The national firework starts at 9 p.m. in the center of the Hungarian capital and the duration of it is about 30 minutes. These colorful pyrotechnics are shooted mostly from the Gellért Hill, but you can see them arriving from floating river cruises and from the street right next to the riverbank as well. Along the Danube thousands of people are celebrating during the day, enjoying the festive atmosphere and waiting for the evening show. We offer this day a special event, a unique Firework Dinner Cruise. This once-a-year dinner cruise includes a delicious 4-course menu, but even the promise of that you will be able to watch the famous firework from a unique spot, directly from the river. Right before the firework starts, we stop at Batthiányi tér which is right in front of the Hungarian Parliament and our guest will have an extremely beautiful view to the monumental building to the Parliemannd and to the light show as well. The cruise starts at 6.45 p.m. on the 20th of August, an hour earlier than our other programs since we would like you to enjoy our whole program and the firework as well. We ask our dear guests to arrive at 6 p.m. since the boarding lasts about 30 minutes. At the entrance, our hosts will greet you and accompany you to your table where you get a welcome drink as soon as you feel comfortable, to make you feel even more comfortable. After the departure, your host will welcome you and inform you about the program of the evening and of course, she will tell all the necessary information about being on board and enjoy the evening. What do we offer you during your Budapest Danube Cruise? • The dinner consists of a 4-course menu, which includes even international, but mostly Hungarian dishes, which reflect the taste of the Hungarian cuisine. In case you have vegetarian preferences or have any kind of food intolerance, you will find the proper dish for you in our menu as well. • Appetizer – For vegetarian people, we offer a light spring salad, and for those, who are adventurers the filled Bruchée bites offer a mixture of the Hungarian taste. • Soup – We offer the most famous Hungarian soup to try, that one, which became a Hungarikum in 2017 - (this means Goulash soup is that kind of value that „represents the high performance of Hungarian people, thanks to its typically Hungarian attribute, uniqueness, specialty and quality”)- will definitely win your recognition. In case you prefer vegetarian dishes, our potato cream soup will be a perfect choice for you. • Main Course – A wide range of dishes represent the Hungarian culture in the main course as well, just like the famous stew with homemade pasta, the duck with cabbage or the fish, but of course we offer light salads or chicken with risotto for those, who prefer to avoid thes dishes mentioned before. • Dessert – After the many courses you may prefer a fruit salad to start the digestion, however, think twice, since our Flan cake would just dulcify the rest of the evening if you try it with fruit ragu. What does our drink package include? • Our catamarans have bars with quality alcoholic and non-alcoholic drinks as well and our barmen are able to prepare your cocktails or any type of drinks as well. • In case you feel comfortable when you have your drink coming to the table unlimited during the whole evening, choose our special drink package which offers unlimited drink consumption during the whole evening, you just have to pick from the list below. Even on this unique evening, we offer 2 types of programs on board. Since the firework starts at 9. p.m. we will have a little pause during the show, but before and after the firework you can enjoy the selected show type while floating on the river and be able to adore the mesmerizing view of the illuminated capital of Hungary. The folklore show is our most popular dinner program. And it is worthily popular, because this is basically an exclusive private theater performance with traditional folk instruments, music and dances as well. The Hungarian folk music is very rich in tunes, while It has many types of themes, just like happy, characteristic, energetic, colorful, or spectacular. Our talented dancers represent a wide range of the Hungarian dances and they will make sure you can try yourselves in dancing just like balancing a bottle of wine on your head as Hungarian women did in history. 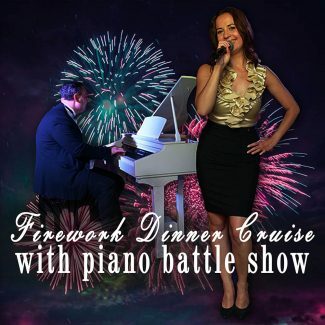 In case you like dinner cruises but prefer a quiet evening in a nice, romantic atmosphere, we would like to draw your attention to our Piano show, which is a magnificent music performance with romantic, happy, melancholic but even entertaining melodies as well performed by two talented pianists who play well-known songs during the evening you will definitely recognize. Our musicians perform one by one and parallel as well, creating a so-called „piano battle” among them, where they fight each other to win the singer’s attention in this romantic triangle.